Up until a little while ago, every time I opened my medicine cabinet, the toothpaste would fall out. Every. Single. Time. I knew there was too much stuffed on one little shelf, so I set about to reorganize the whole thing. You know what? It’s the little things, like not getting hit daily by a tube of toothpaste, that make life a little more pleasant. Depending on the size of your bathroom, you might have a medicine cabinet, a vanity or a full on cupboard with shelves. 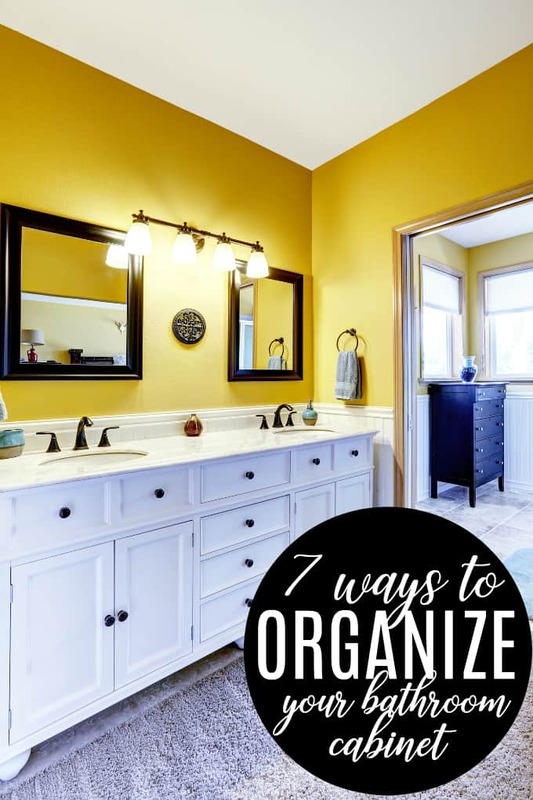 However you are set up, there are some simple ways to keep things organized so that you can find what you need, when you need it. Only daily essentials should be placed in the cabinet, within easy reach. Other items that you use less frequently or are bulkier, should go in a linen closet or under sink cabinet. And make sure that every product in the cabinet hasn’t expired. You can’t keep open lotions and makeup forever and any old items should be disposed of. Keeping all the hair elastics and clips, cotton balls and q-tips handy is much simpler if each item is grouped together and easily found thanks to see-through containers. Whether plastic or glass, the ability to see what’s in each one without taking it out will keep your essentials easy to locate. For things like makeup brushes, you can opt for a more cup like container, to keep them all together and upright, easy to see and grab hold of! TIP: A great option for bobby pins? An empty Tic Tac box! If the shelving within the cabinet permits, applying magnetic strips on the INSIDE of the door will allow you to put things away like tweezers, cuticle scissors, and hair pins, neatly and easily. Other options are stick and strip plastic hooks that are easy to install and remove. The hooks are also a good option on the inside side walls of the cabinet, for small scissors and other beauty implements. Binder clips to use with the hooks are perfect for popping that pesky, always falling tube of toothpaste up on the side of the cabinet and off the shelf! If you’re sharing your cabinet with family members, give everyone a plastic tray, labelled with their name, to put their products in. Even better if it too is see-through or at least shallow enough to be able to see what’s in it, at a glance. It can be hard to see what’s in the back corner of an under sink cabinet, so adding a lazy susan inside it, to be able to quickly and easily get to items, makes a lot of sense. If your under sink space doesn’t have shelving, add some that fits even with the pipes for the sink in the way: corner shelves or stackable baskets can help keep some order in there. If you have a full on cupboard or larger shelf space in your bathroom, use baskets to keep like with like and all items organized: towels, extra soap / shampoo bottles or bars, makeup remover pads and so on. You can get small plastic risers, which will help you leverage the vertical space between shelves and still allow full visibility of everything in the cabinet. And if your bathroom is too small for even a cabinet? Hang a shoe organizer on the back of the bathroom door—the ones with clear plastic pockets are best—to store makeup, toiletries and face towels. Leverage the often unused space above the toilet to put shelving that will give you a little more storage. Add a second curtain rod on the wall side of your shower and use shower curtain clips to hang everything from your favourite tube of cream rinse, plastic holders for your shaving needs, towels and poofs. This has the added advantage of being a little high for smaller hands, if you want to keep your razors or expensive conditioner out of reach! Fix a metal hanging basket to the ceiling, assuming it’s not too high, or even from the shower curtain rod, to put the shampoo and soaps, sponges and loofahs, to keep them handy but out of the way. Organizing a small space like a bathroom cabinet is a quick and easy way to simplify your storage needs. If you’re not spending five minutes looking for something, it’s five minutes you have to spend on an enjoyable activity. Do you have any cabinet hacks to share? Great tips! Thank you so much. I love the tip to put bobby pins in a tic tac container – so smart! I love the idea of using a second shower curtain rod. That would be so helpful! Thanks for the ideas. I use a second shower curtain rod to hang up wet towels. These are great tips love the rod idea. Awesome tips! i am thinking about doing a major organization in the bathroom and I will definitely be looking into getting see-through containers. i love the look of them too. The bobby pins in Tic Tac boxes is a genius idea! I love your tips, ideas and advice especially the shoe organizer and the Tic Tac box for for bobby pin Great ideas ! I really like the idea of the see-through containers. Otherwise you are going to end up grabbing the wrong container! Some great tips! We are moving in the 2018 so definitely will remember some of these when we set up our new bathrooms. Really helpful tips here. I could definitely use some see through containers to start. Great tips! I am all about stackable storage and leveraging the vertical space; its the only way I can get everything organized in the bathroom! I love these tips. Our cabinets are so small and I can’t find anything. I am going to use some of these ideas!